Every journey we take is accomplished one day at a time. Difficult journeys; normal journeys. Hard journeys; easy journeys. “One Day At A Time,” no matter the journey, creates significant power on the very first day of a journey. One day at a time is the salvation of daily life. We don’t have to conquer the mountain in one day, nor must we eat the elephant in just one bite. 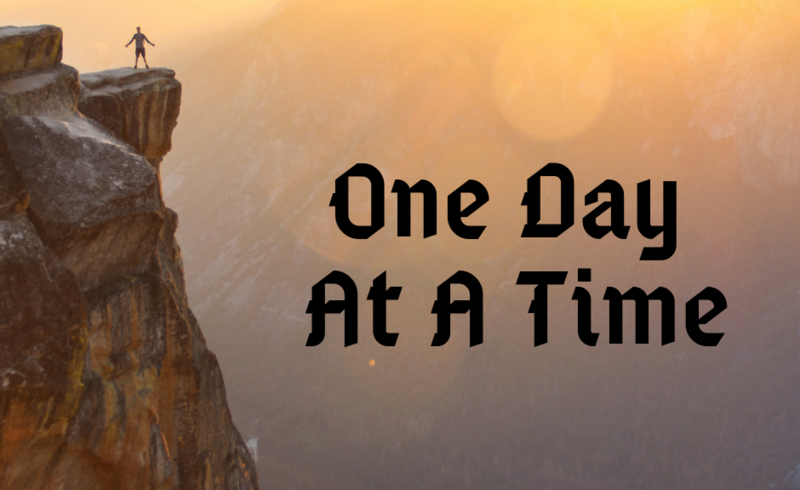 I first learned the power of “One Day At A Time” as I watched my dad walk the arduous path of sobriety. Alcohol had a firm grip on dad and his sobriety journey was most difficult. There were days when he didn’t know if he would survive. I didn’t know if he would either. Yet, he kept going, One Day At A Time. That’s where the power comes in. When dad stepped forward, determined to get up and walk his journey, no matter how difficult it was, he truly started to accomplish great things. Where they great things the world saw? Not really. But they were great for him, and they were great for his journey. And it all started with Day One. Day One is powerful because of the magnified power it creates for Day 2, and then exponentially magnifies for Day 3, Day 4, Day 5, Day 6, and Day 7. Then with a creative multiplying force, the power of our WHY, our reason, our cause, continues to build One Day At A Time. Dad’s why was aided by the “12 Step” program of Alcoholics Anonymous, his faith, and family. Not all worked at the same level, nor did each work every day. But his consistent efforts, along with years of support and encouragement, helped his journey of sobriety reach nearly 40 years before he passed away. It all started with One Day At A Time. Such will be our journey, no matter what it is. Building a business, build it One Day At A Time. Writing a book, write it One Day At A Time. Overcoming an addition, gain sobriety One Day At A Time. Some days will be hard; some will be easy. Some days will be most difficult; some a walk in the park. Hard or easy, the journey forward continues One Day At A Time. One day becomes two, two days becomes three, three becomes four, then five, then six, then seven. Then one month, which becomes two months, then three, six, and nine months, and then, finally, we hit our first year. As my dad had his support systems, there are also support systems for you, no matter your journey. I am building a business. This is truly a One Day At A Time kind of journey. I have had incredible support on this journey from family and friends who have believed and encouraged. I have found professional support from fellow business owners in my BNI and Connect Utah networking groups and the Cache Chamber of Commerce. I have been to training conferences, workshops, and seminars, from some well-known names like Tony Robbins, and some who are not so well-known yet still very effective. I have also connected with coaches, mentors, and advisors, some formal and many informal who have shared their time, skills, expertise and guidance. While it may feel challenging reaching out to another person for guidance, it’s quite rewarding when you do and then receive their support and encouragement. Establishing relationships with informal mentors willing to share their guidance has been incredibly helpful in building Red Edge. Other business owners have shared their advice and practical tips, helped me work through difficult situations, and answers to challenging questions. Formal mentors can also be incredibly helpful. Those counselors, coaches, advisors, therapists, and trainers we pay for their skills and talents can help us grow beyond our own efforts. Their vision, insight, knowledge, and skills can guide our efforts and help us implement crucial strategies, no matter our journey. I have been helped immensely by both informal and formal mentors. I’m grateful for the multiple conversations, the generous ideas shared, the counsel given. It’s not easy to ask for help, no matter your journey. It wasn’t easy for my dad to ask for help. Addiction can create feelings of shame, embarrassment, anxiety, pain, guilt, anger, depression, and many other challenging emotional feelings. Nor is it easy asking for help along the business or career building journey. We often feel we must walk our path alone. As entrepreneurs, we may technically be solo business owners. But that does not mean every step of One Day At A Time has to be a step taken all alone. There are people, organizations, and support systems ready and willing to help, both formally and informally. Finding a mentor can be easier than you may think. Lisa Quast, writing in Forbes, suggests one of the most important things we can do is clarify what you are looking for. Once you have clarified what you are looking for, reach out to people who could help or who may be able to introduce you to the right people. Talk to people in your social circles, professional fields, and even your local church and community organizations. Once you start putting out feelers, you’ll discover your circle of resources is bigger than you realize. Once you have identified a potential mentor, request a meeting. Be clear in why you are requesting the meeting. My experience has been most people are willing to have that initial conversation. Clear communication and expectations are key. Set up a timeframe of how often you’ll meet and for how long and what each one of you will do. Finally, one last resource, Red Edge Mentoring. Helping entrepreneurs, leaders and speakers share their story to better influence themselves, their team, and their customers is what I do. Let’s brainstorm. Pick my brain. Ask your questions. If I don’t know the answer, I will know someone who does. One of the ways I do this is through the Red Edge Strategy monthly workshops. Our next one is February 21 from 3-6pm in Logan. We’ll focus on developing your brand story to better influence yourself, your team, and your customers. Drop me a note if you would like to be part of it and I’ll get you the information. Life is tough and also beautiful. There will still be hard days. There will still be easy days. Rise to the occasions presented. Create new opportunities to soar. One Day At Time, as you will continually discover, really does work. p.s. Take 13 minutes today to discover what mentor resources may be available for you.